South Florida Blog for Fashion & Lifestyle | Frugal Flirty N Fab! : Tuesday Look of the Day! Tuesday Look of the Day! Happy Tuesday Fashion Fabsters, I hope everyone is off to an excellent start this beautiful day! Just wanted to take a quick second and share with you my Tuesday Fit of the day, so let's have a look! I've been fortunate enough to work in a pretty casual atmosphere which gives me the ability to be as fashionable as I want between the hours of 9-6 (job perk)! With this being my situation I try to make sure most of my shopping purchases are items I can wear for work, play, and everything in between! It was definitely luv at first sight when I found this cute maxi skirt at Sears...Yes Sears, and to my luck, the Price was Right! Threw on a cute black coverup (not seen here) and I was all set for the day! What does your Tuesday Fit of the Day look Like? Love this look! Especially the skirt; love the print! Thanks Nic! Yes my favorite thing about the skirt is the great pattern and colors! I'm going to my Sears to find that skirt. I really like it. The earrings are super cute too! Thanks Stesha! I hope you enjoy the skirt as much as I do! Very cute and comfy look! 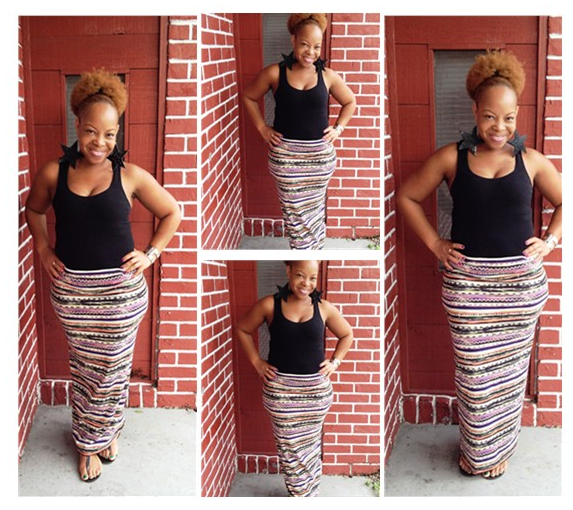 I'm a huge fan of maxi skirts and this pattern of this one is great. I enjoy the same perk as an educator. I can keep it professional but put my spin on looks for the classroom. Thanks Kerissa and yes the skirt was chic as well as super comfy! Very cute! Looks like your job allows you to have fun! Thanks Karen amd yes I do my best to make it a fashionable 9-6!